As bad as the stock sell-off in the U.S. has been, investors seem even more worried about a possible credit downgrade of France and what that would do to French banks. NEW YORK (CNNMoney) -- Standard and Poor's only downgraded the credit rating of the United States on Friday. But the financial markets have picked up where S&P left off and essentially decided to downgrade much of Europe too. It appears that one of the unintended consequences of S&P's decision to cut the U.S. to AA+ from AAA is that investors have begun to question why nations like France, the United Kingdom and, to a much lesser extent, even uber-strong Germany should still have perfect credit ratings. But it is France that is really feeling the brunt of the market's doubts right now. Shares of French banks Societe Generale, BNP Paribas and Credit Agricole have plummeted in Paris due to wild speculation about their financial health. The entire French market has been hit by what Josh Brown, aka Twitter's @ReformedBroker, calls The Debt Baguette. 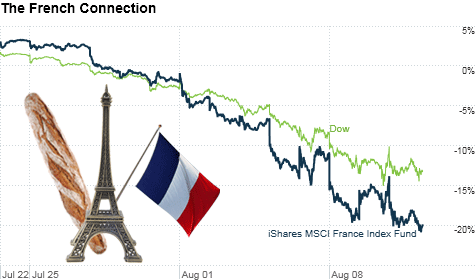 If you think the market turmoil in the U.S. is bad, take a look at the iShares MSCI France (EWQ) exchange-traded fund. It's down more than 20% since this recent round of market turmoil began in earnest on July 22. Sure, French stocks, along with the rest of Europe and the broader market in the U.S., did rally Thursday. But the reason for the surge was preposterous. Reports of a short selling ban in France and equally hard-hit Italy (the iShares MSCI Italy (EWI) ETF is down 22% since July 22) sparked the move higher on the notion that a temporary halt on short selling could help stem the bleeding. It may. For a day or so. But students of recent market history should remember that when the Securities and Exchange Commission briefly banned short selling of financial stocks in 2008, that failed miserably. Slapping the shorts on the wrist won't change the fact that France is almost as indebted as the United States. France's debt, as a percentage of its gross domestic product, hovers in the mid-80s. U.S. debt is about 100% of GDP. "When you look at the budget problems of France and its debt to GDP ratio, one can argue that if there was a need to take action on the U.S., there needs to at least be a review of France," said Wasif Latif, vice president of equity investments with USAA Investment Management Company in San Antonio. But France also suffers from the fact that it's part of that whole little EU/PIIGS debacle. French banks, like their Italian counterparts Intesa and Unicredit, were struggling even before investors started worrying about a possible hit to France's credit rating. "French banks have already written down exposure to Greek debt but the S&P downgrade of the U.S. has had a cascading effect. There are now even more questions about funding and access to capital," said Andrew Busch, global currency & public policy strategist with BMO Capital Markets in Chicago. The sad reality is that S&P opened up a can of worms. And France is the obvious choice to focus on next for a possible downgrade. The U.K. benefits from the fact that is not part of the euro zone. Mark Vecchio, a partner focusing on international finance at Venable, a law firm in New York, added that Germany is still "the sole beacon of light in the distance in Europe." U.S. Treasuries are still safe! Sorta. Sure, some may argue that the U.S. shouldn't have been downgraded in the first place, that's now irrelevant. What's done is done. But consider this. AAA-rated French 10-year bonds are yielding about 3.05%. That's not exactly sky-high, especially when compared to Italy and Spain, let alone Greece and Portugal. However, in the U.S. the 10-year Treasury yield is about 2.35%. You don't need to be a math genius to realize that even though the U.S. is AA+, fixed-income investors are still lapping up Treasuries because they believe Uncle Sam's debt is more secure than France's. "There is a disconnect here with the ratings. People fled to Treasuries after the downgrade," Vecchio said. "The problems in the periphery in Europe hit close to home in France. It has much bigger exposure to the soft underbelly of Europe than the United States." Reader comment of the week ... and I'm Mosely! Doing the reader comment of the week today because I am (thankfully) off tomorrow. 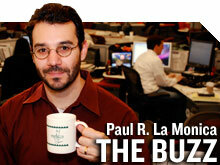 The Buzz will be back Monday. Anyway, I love when you can kill two birds with one stone. I owe a Buzz shout-out to a reader for correctly identifying a movie quote. But that reader also wins the comment of the week! On Thursday, with the Dow on its way to another 500-plus point drop, I asked Twitter followers to name where this movie line (which incidentally is about airplanes and not stocks) comes from: "These things go down! It's too big! It can't go up!" The answer is "Midnight Run" -- the classic Robert DeNiro/Charles Grodin (and don't forget Yaphet Kotto!) comedy. Brian Schoenborn was the first to get it right. So that's why he deserves a shout-out. But it's his pithy remark about financial stocks after he named the movie that earns him the reader comment of the week. "Midnight Run...look for the sequel: Midweek Bank Run," he wrote. Ha! But investors in Bank of America, SocGen and other global financial giants aren't too happy with the plot of that particular movie. Pass the Pepto. Market volatility here to stay.